I never gave much thought to Lurchers. I knew they were supposed to be the dog of choice of Gypsies but that was about it. I decided to look a bit further. For a start, a Lurcher is just a mongrel, but is a defined mongrel, which means that it’s cross between a Sighthound and a Scenthound. And I had never heard of those either. A Sighthound is apparently a dog that uses sight and speed to hunt, and a Scenthound is a .. well, work it out for yourself. Because of the Sighthound bit, Lurchers are fast. They are not only exceptionally fast but they are also exceptionally lazy. Someone used the description “a 40mph couch-potato” and that about sums up our Penny to perfection. 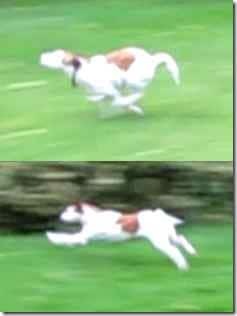 Another thing that I discovered is that Sighthounds have a thing called Double-Suspension Rotary Gallop. Fancy name, huh? Even my car doesn’t have that. Apparently what that means is that when running, each full stride has two periods when all four legs are off the ground, and they use their spine as a sort of spring. And there are the two airborne cycles. In the top one, she is coiling up and in the bottom one she has released the tension into a sort of high-speed long-jump. Make the most of those images as they are about as rare as a photograph of the Lough Ness Monster and just as blurry. As I type this, our Penny is in her usual place – curled up and snoring gently on the couch. I think she had a speed-fit earlier in the garden which is when she does several laps of the main lawn in a couple of microseconds. It’s hard to tell though as these fits are over before they start. I have more than a suspicion that the Theory of Relativity is coming into play here. So here endeth the lesson for today. Congratulations on reaching the finals in both catagories. Will you be attending? Thanks, tt! Decisions, decisions! Time will tell. wow she can really blur by! Cat – You have no idea! She has a burst of speed once or twice a day and she literally just becomes a white streak shooting past the window. Another thing I learned is that Sightdogs are the fastest mammal on Earth second only to the Cheetah, and the Cheetah can only maintain speed for a very short time before running out of oxygen. Anne – They are the dog of choice for poachers. Need I say more? Mick – Nah! To few of ’em around at this time of year. I’m concentrating on the driving lessons at the moment but the only thing she has gotten the hang of so far is switching on the hazard lights. Aw, thanks, Brighid! My apologies for leaving you stuck in the backroom for a bit. You should have shouted! Congrats on high speed photos………we need lots more photos from you…………..Garden….Den…..lake?…..
You are quite good with the old clicky-click. Welcome Roderic! The problem with taking photographs in the village is that you would all want to come and live here. Also a lot of the residents wouldn’t exactly relish having their photographs published. I would have to fuzz out all the faces which would be a bit of a pain. Maybe I’ll start including more photographs? We’ll see…..